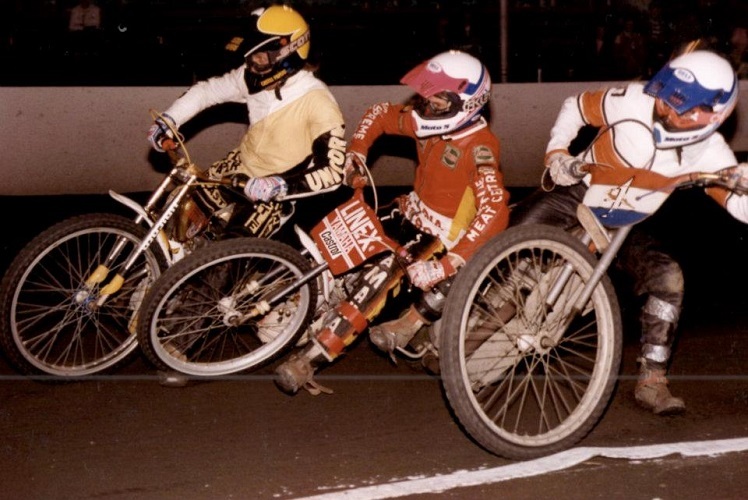 1988 was Speedway's 60th Anniversary year. 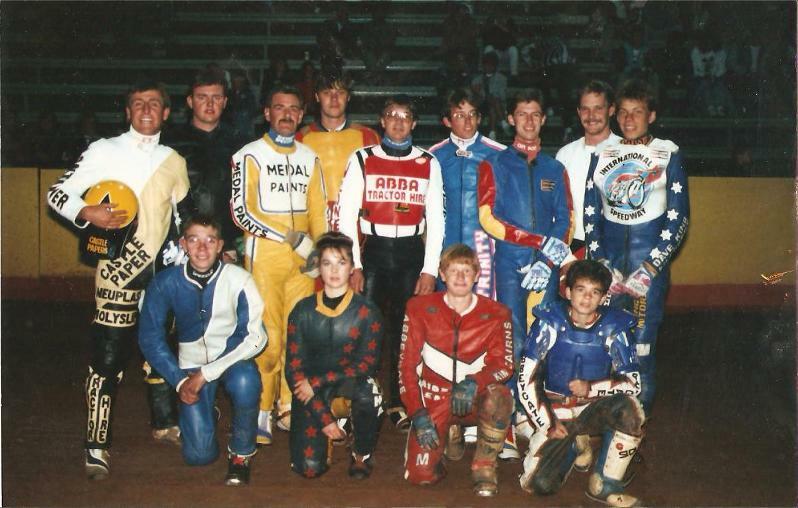 This photograph depicts the gathering of speedway riders (and drivers) at the Corobrik track in that year. If you can add anymore names please make contact. Knlg : Danie Fourie, Des Haswell, - ? - . 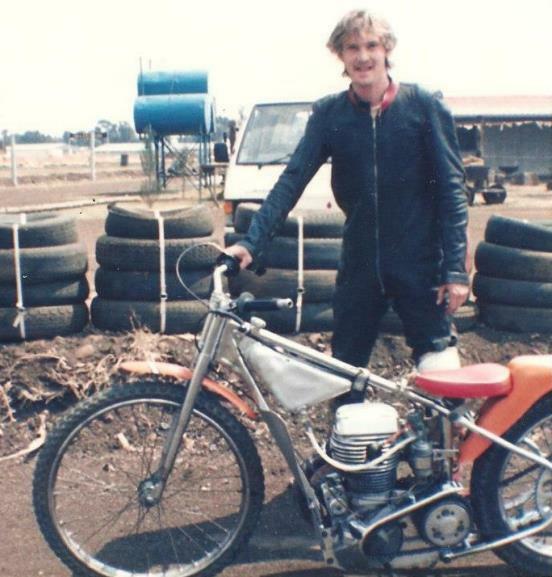 S.African Speedway Riders Portraits from the 1970s to the '00s. 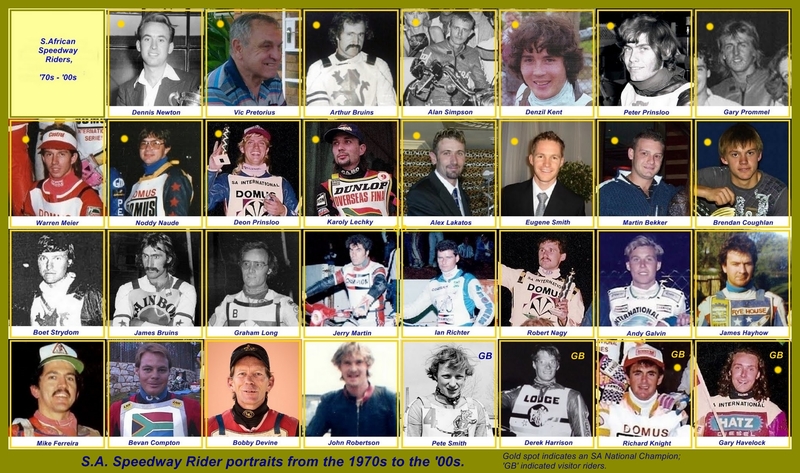 To complement the collage of SA dirt track speedway rider of the immediate post-war period produced previously, presented below is a collage of riders from the near past, - 1970s to mid- '00s - , including all SA National champions during this period. Click for full screen, adjusting your Zoom to suit. 1975 - World Champions Troupe tour of Southern Africa. 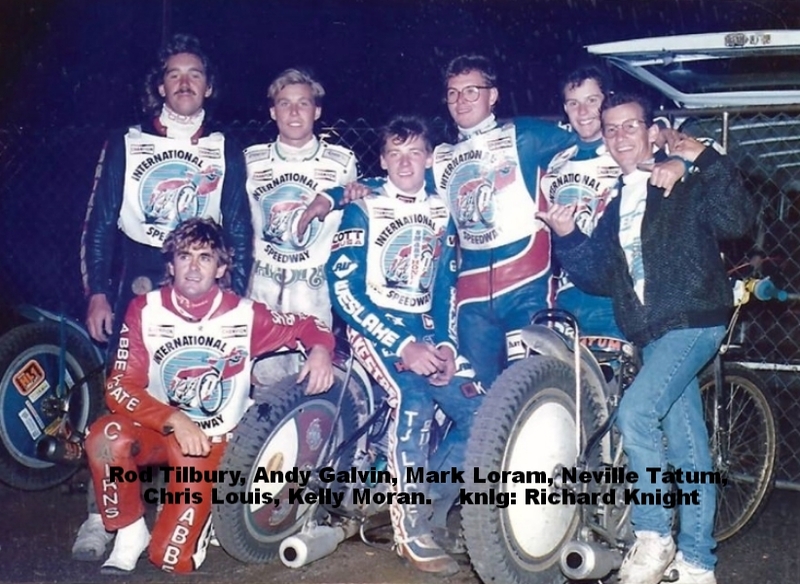 Egon Muller GY, John Louis GB, Barry Briggs NZ, Ivan Mauger NZ, Ole Olsen DK, Scott Autrey US. Wld Champ:1983(+LgTk:'74,'75,'78); 3rd 1985 (GB '75); 1957, '58, '64, '66; 1968, '69, '70, '72, '77, '78;. 1971, '75, '78; 3rd 1978. 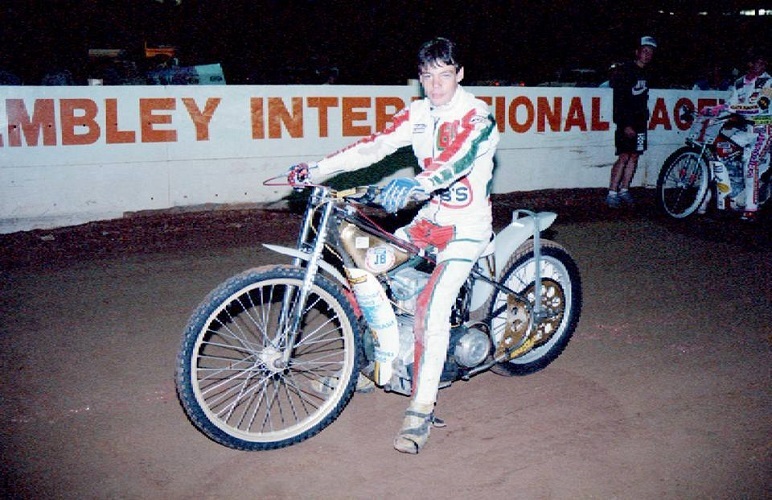 After the hiatus of the '60s South Africa was anxious to re-build speedway racing but in 1972 even Buddy Fuller struggled to tempt a British squad to tour. His solution, - invite the Yanks ! 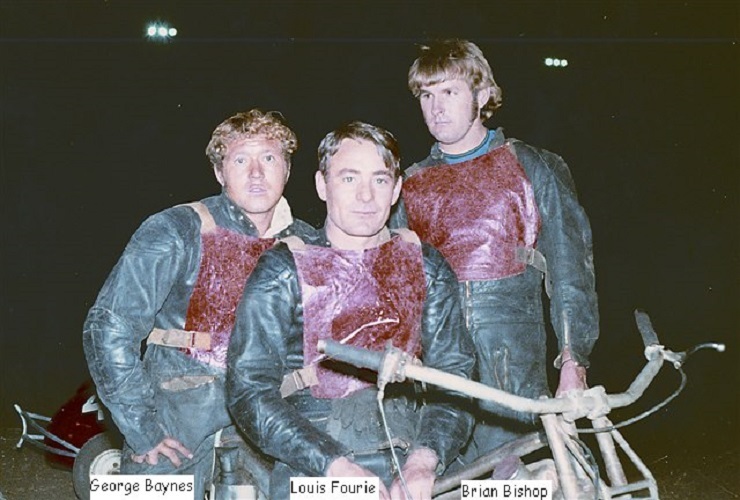 A 4-man team comprising current US champ Rick Woods, Scott Autry, Mike Carusso and Sumner McKnight raced the new Republic in a Test Series at Wembley (Johannesburg), Dunswart (Benoni), and Hoy Park (Durban) after Fuller had ripped up the tarmac. 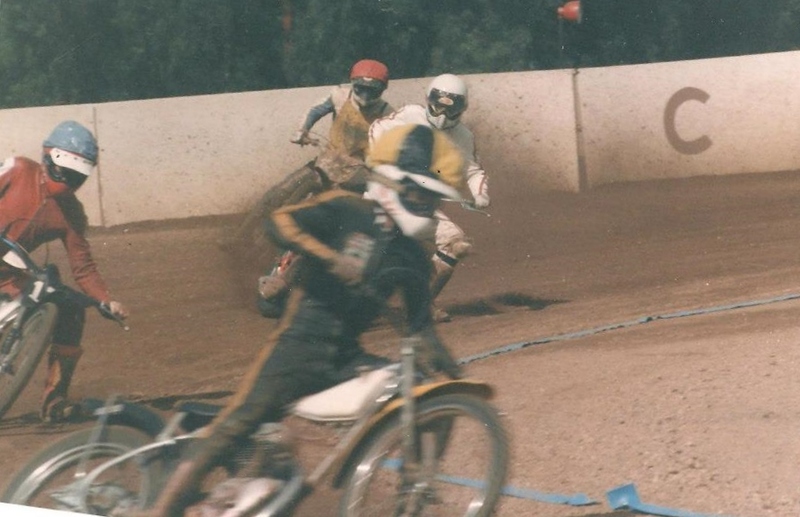 After their decade in the wilderness the local riders had to concede the Series to the visitors but the sport had been awakened, and the Yanks success in turn convinced them to spend their next summer in UK domestic racing. his 6th and last National Championship success, a feat not bettered by anyone before or since. Etienne Olivier traveled to Scotland in 1973, making one pointless appearance for Division 1 team Coatbridge in August before securing a Br.Lge. Div.II. place with border-town Berwick in September of that year. In 8 league matches he averaged 4.15, capping off the season with his best performance of the year with two 7-point scores in the Bandits' October curtain-closer double header. He chose not to return to UK the following year. Rhodesian Mike Ferreira however did fly to Scotland in 1974, where Coatbridge had elected to move down a division. Ferreira was given a reserve slot from the off but pulling up no trees, lost his place after a month. 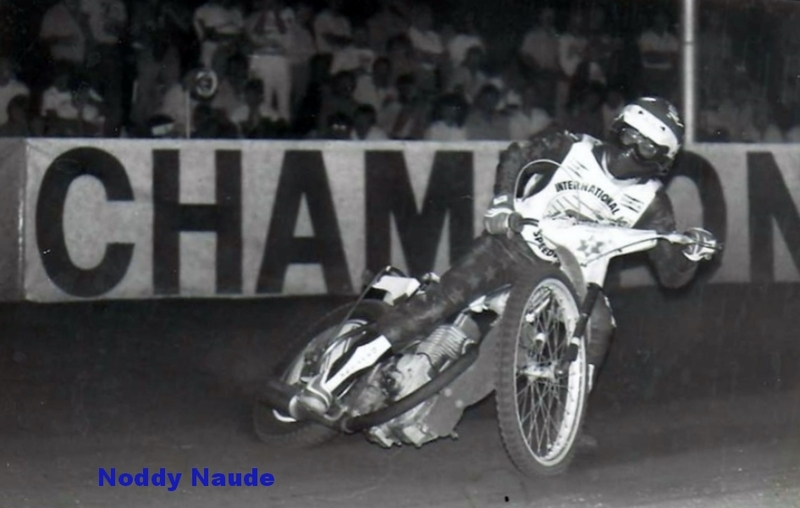 He returned home at the end of the season to race at Bulawayo and Salisbury, returning to the UK only in 1978 after solo speedway had ended at home. 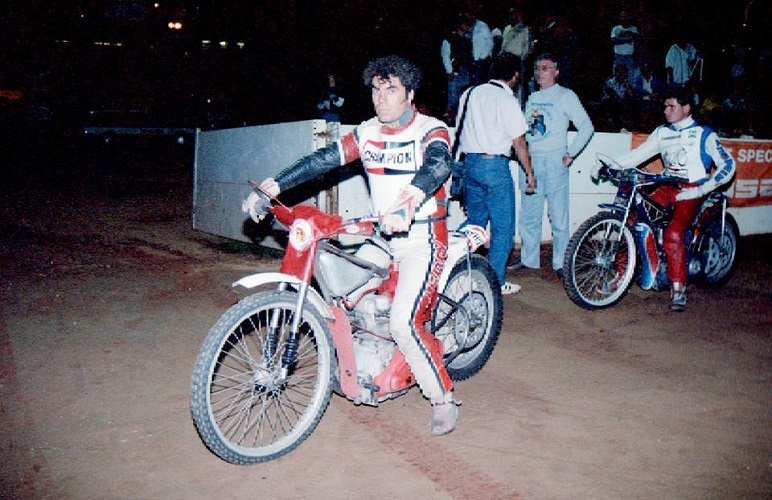 This time, in the South of England at Canterbury and Swindon, he showed steady improvement, winning the Div'n II Riders Championship in '81, and ending his European career with the legendary Wimbledon Dons. His many championship successes in Rhodesia and South Africa are logged on this Southern Africa page, (incl'g Spplt.1: 'MRCs and Rhodesian Track Championships'.). 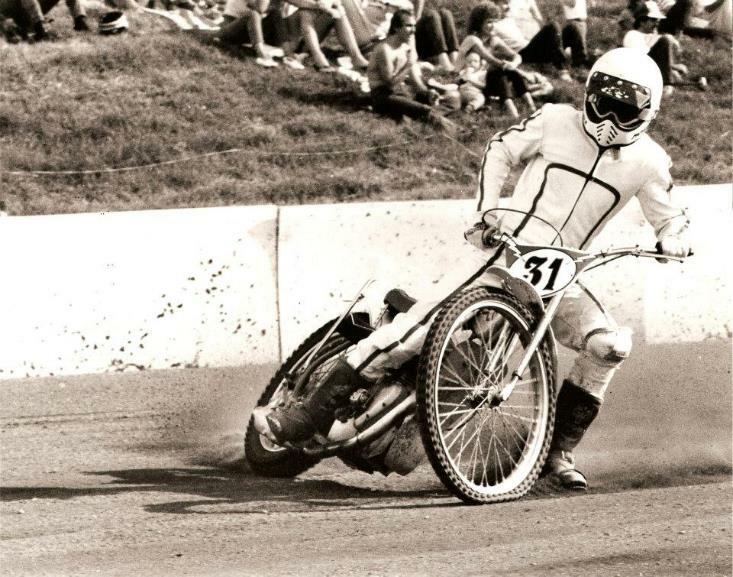 After Wembley closed the Rainbow site was constructed for dirt track speedway in 1975. This slideshow uses photos just released by Bernd Kroemer that he originally held back for quality reasons but released now for the historical significance. Wayne Coughlan leads Vic Pretorius at Daggafontein in 1975. LT: James Bruins & Graham Long (plus Golden Helmet.) RT, + below Lt. in action: Arthur Bruins. 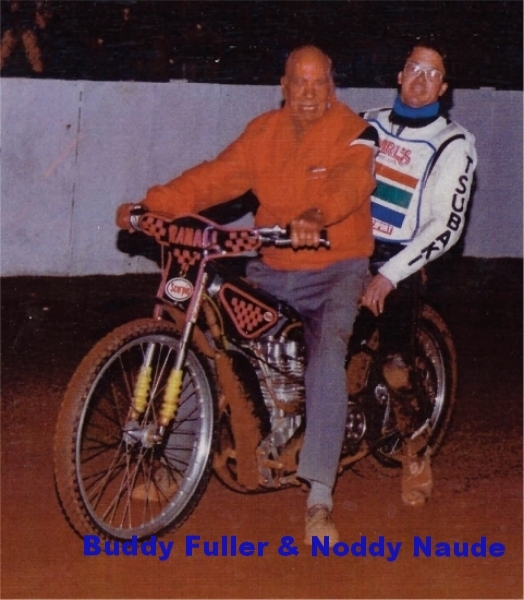 A unique item, - this is the programme from the one-and-only speedway meeting, i.e. solo motorcycle dirt oval racing, held at Oudtshoorn in the Western Cape. 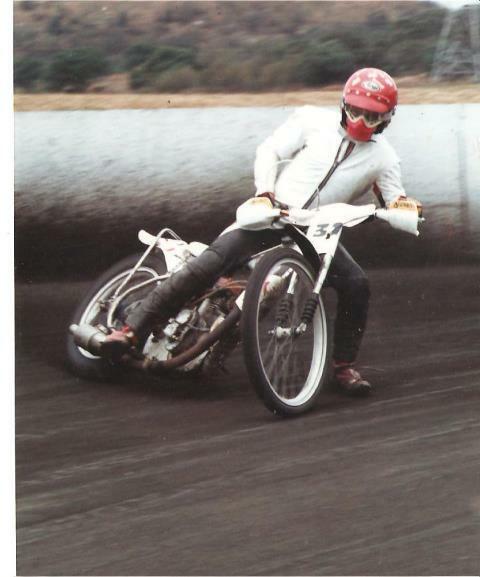 The meeting of 25th Nov. 1978 was run by Buddy Fuller in conjunction with the local club and staged in 2 parts, - 2-wheeled speedway in the afternoon and 4-wheel Stocks and Modifieds in the evening. In a programme of over 20 solo races Peter Prinsloo established a 1-lap track record of 18.3 secs. for the 400m. circuit: he also took the main event, an international 3-lap match race competition run over 4 heats, 2 semis and a final by defeating Brit Pete Smith for the Golden Helmet Award, but had to concede the Oudtshoorn Motor Club Trophy, (over two 4-man, 4-lap heats and a final,) to fellow Rhodesian Mike Ferreira. Other riders competing included future SA champs Denzil Kent and Steve Wilcock. 1978 Southern African Championship, Pre-meeting Line-Up with sponsors jackets. Frt: Peter Prinsloo, Nigel Close, Bert Harkins (winner), Bennie Rourke. Dunswart Devils/Bees, 1979 > 1984. The 2 photo below are of Dunswart teams, taken between the late '70s and early '80s. Two teams emerged in the Republic near the end of the 'seventies, – Tarlton Tomahawks and Dunswart Devils – , representing the two existing Transvaal tracks. They were formed to provide team racing for the public to supplement the repetition of individual meetings, but seems to have been only moderately successful as the fans tired of matches between the same two teams. 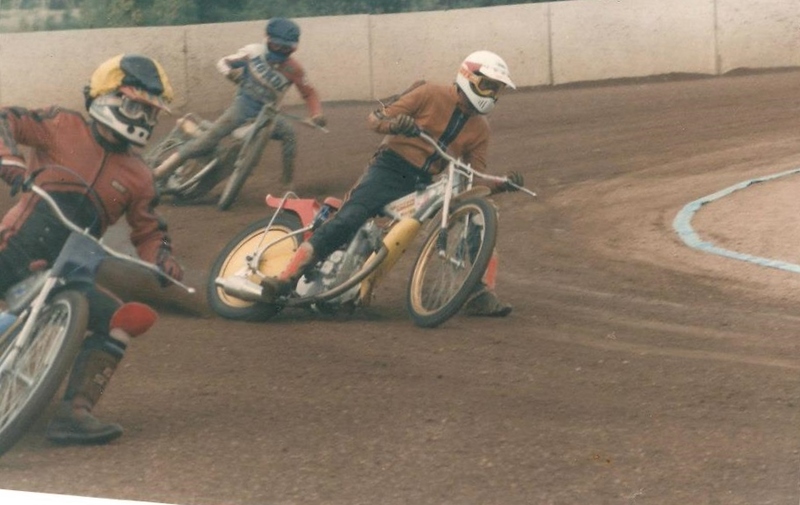 The first photograph, showing the Devils team of around 1979, captained by Arthur Bruins, is thought to probably have been taken at Tarlton, it being a large 400m-plus track. When racing began to tail off at Tarlton, and Pretoria opened, these derby matches were replaced by Pretoria v. Dunswart matches. Pretoria adopted their old nickname, the Eagles whilst Dunswart dropped the Devils moniker and became the Dunswart Stars. By 1983 the Honeylube Oil company had been secured as sponsors, conditional on a name change. Dunswart Honeybees, more familiarly known as The Bees, can be seen in the second picture, captained by the remaining former Devil, Noddy Naude. Action from the early '80s , . . - Kent, Jessup, Miller, etc. 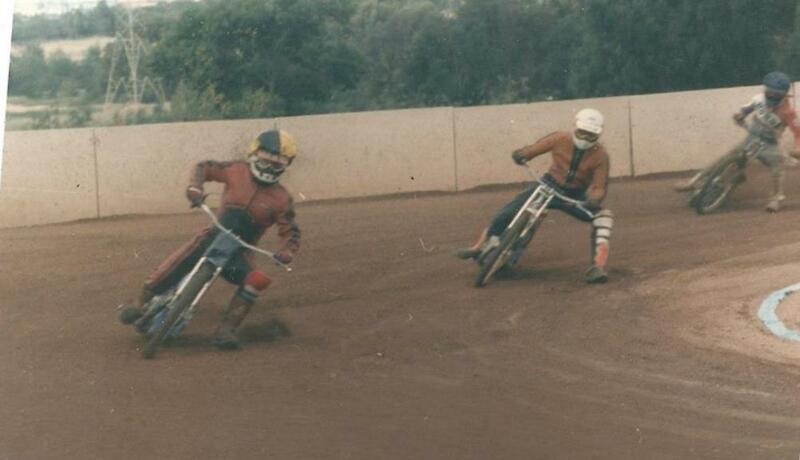 incl'g, as below, Colin Ackroyd and Alan Simpson in 1981. - Click below for Slideshow. 1981, - S..Africa v. Overseas, Milner Park Johannesburg, 24.1.81. Indoor shale track 3-day meeting, the Test on final day being first of four Series, won 3-1 by the visitors. 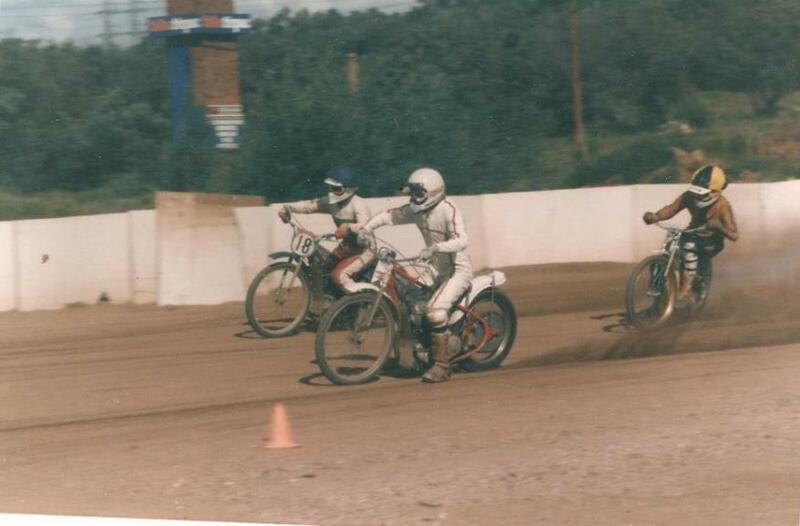 Rear: Arthur Bruins, James Bruins, Derek Harrison, Gary Prommel. 1982: Action from the same period, one year later. 19.1.1982, SA v USA at Milner Park. 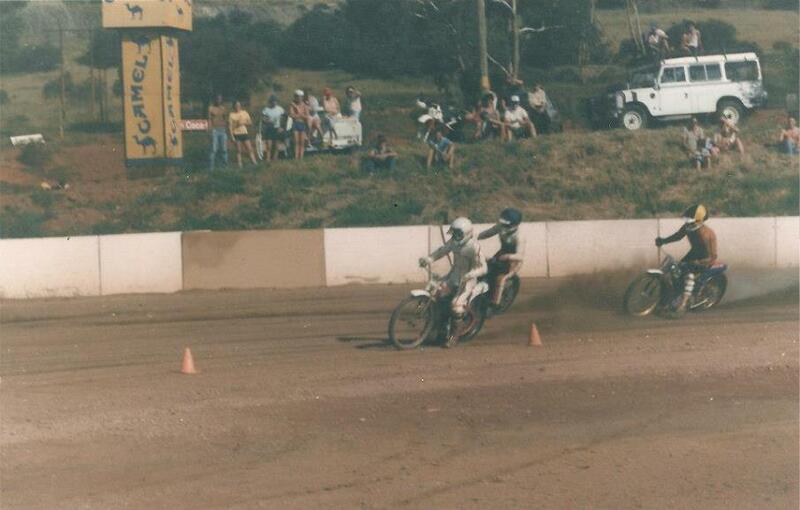 Denzil Kent chasing Tom Dickerson, while Rob Borg and Noddy Naude get into trouble. Video of the 1983 first Test Match, South Afica v. Overseas at Milner Park, Jo'burg, 17.2.83. - Prinsloo, Prommel, Simpson, Harrison, Kent, Naude, Cothill versus the visitors. 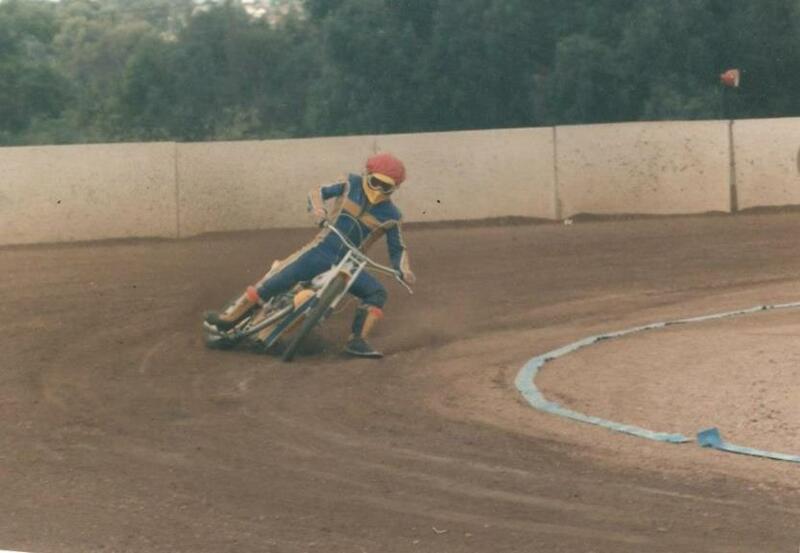 below: - a rare shot of the Xanadu training track, 1980's - John Robertson in action. 1986 SA Pairs Champions, Wayne Coughlan and Eddie Cox, seen after winning the event at Corobrik. 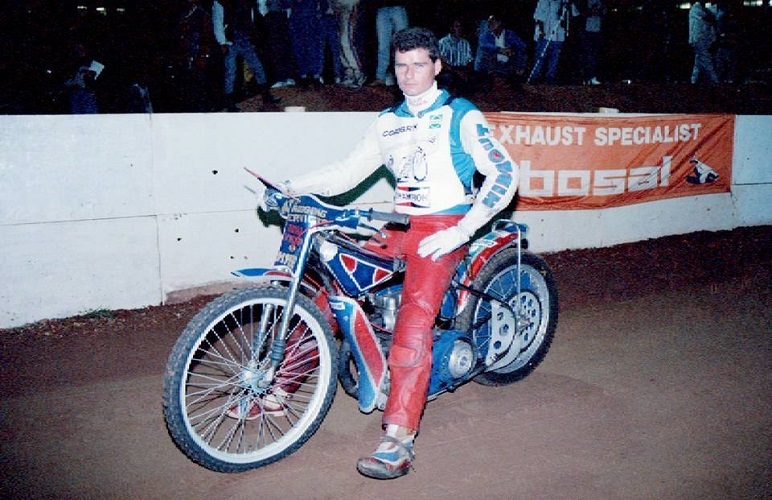 Eddie went to the UK in '88 where he had rides with Long Eaton's junior league team. 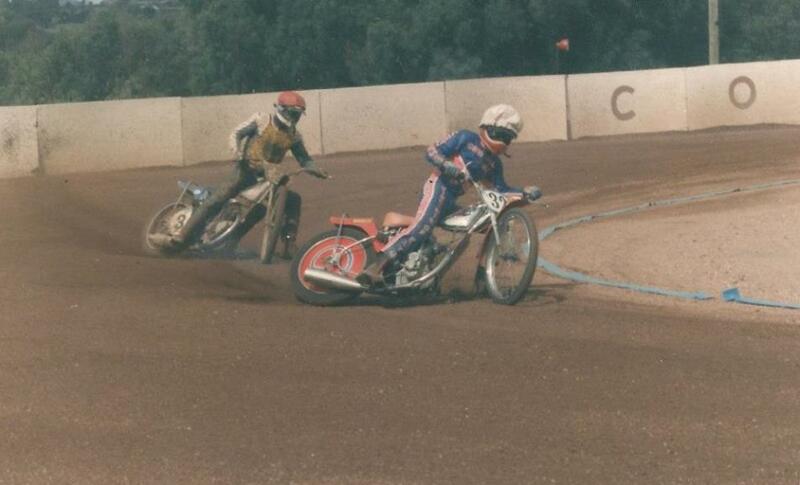 Below, Eddie in action on home soil. Dean Foley, Ivan Michelle, Ian Hemmings, Chris Smith, Richard Smuts Steyn . - the Starting Marshall is Danie Fourie, and the fella on the centre in red & white is Boet Strydom. A cluster of shots from Noddy Naude, circa 1990. C Aitken/Batchelor 14, M Aitken/du Duallier 9, Coetzee/du Toit 9, Allsopp/Cowdy 7, Kotze/Springorum 6. Fred Slabbert/Grant Rust 12, Andy Cox/Michael McDaniel 7, Leon Vermaak/nk 4, Colin Bezuidenhout/Terrence McDaniel 1, Roy Slabbert/Colin Atkinson 0. Collection of shots of Warren Meier, SA Champ of 1991 & '92, and contemporaries. 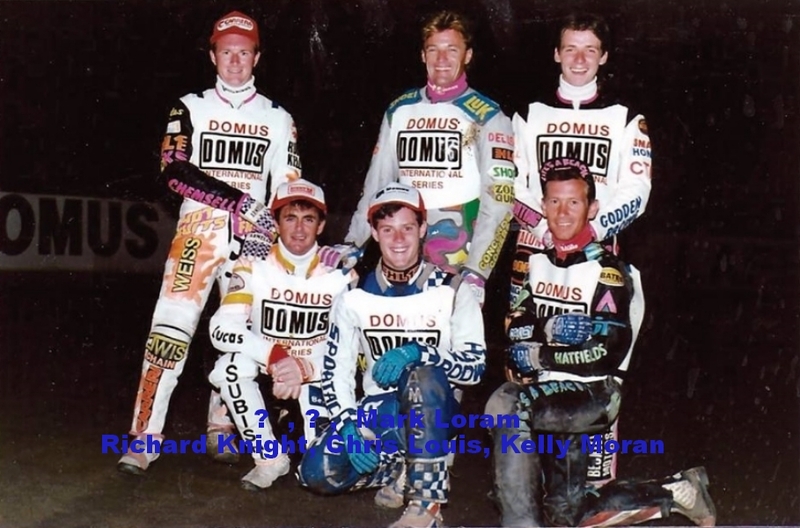 Former rider John Robertson (on the back row,) has emailed to give us the following names of most of the line-up in the shot below. Can you help identify any one else ? Rear: Gary Prommel, Richard Duke, Ashley Meade, ? , Noddy Naude, Eric Allen, Kevin Ritchter (or Ian R.), John Robertson, Sean Swart (tbc). Front: Daryll Baldwin, Jolene Naude, ? , ? . 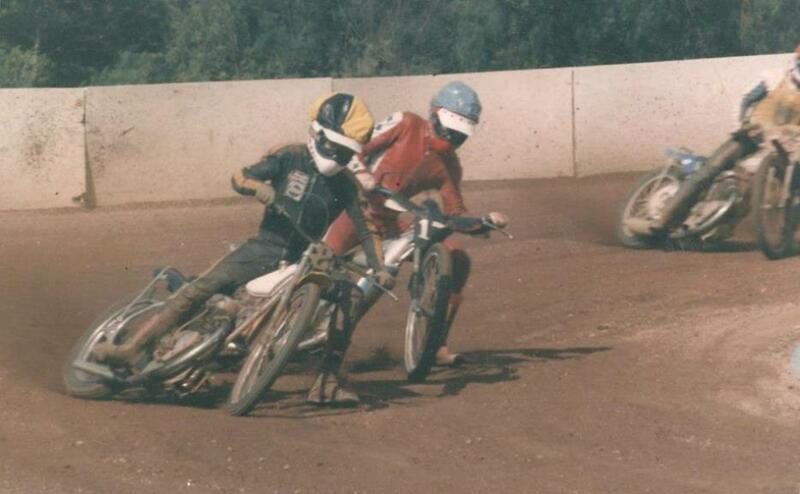 Below, another shot of dirt track boys from the early 1990's. Can you help with the locatiom, year, and the 3 missing names ? Rear, L>Rt; Alan Simpson, Grant Foley, Denzil Kent, Ian Richter, Warren Meier, Deon Prinsloo, Ivan v.Niekerk, ? 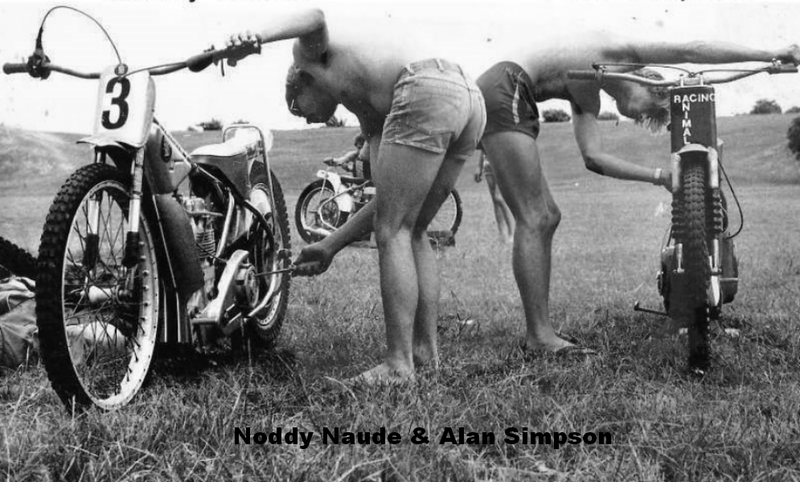 ; Front, L.Rt; Darryl Baldwin, Noddy Naude, ? , Gary Prommel. G. Prommel,A. Simpson, I. Richter, W.Meier, D.Prinsloo, D/Kent, F RT: N.Naude & G.Foley. The 2 picture below are from the 3rd Test between Hungary and South Africa at Nyiregyhaza. Kneeling L to R: Richard Duke; Warren Meier (with flag); Des Jones. 2). SA pits at the same 3rd Test.,Grant Foley in the pink shorts. Results of the 3 matches, at Miskolc, Debrecen and Nyiregyhaza, can be found on the Test Matches p2 webpage. The SA version of "The Laurels" was first held in the capital Pretoria in the mid fifties, but disappeared from the programme following the SCB/SRA dispute and the Republic's isolation of the 'sixties. It was resurrected in 1992 but this '93 event, won by Glasgow's Robert Nagy, is believed to have been the last staged. frt: (guest S.Buskiewicz,) Laszlo Stefani, Attila Stefani, Ivan van Niekerk, Karl Lechky Snr, manager. In 1994 South Africa sent a team to Poland to partake in a series of club matches. The team can be seen above lined up for the match at Ostrow. 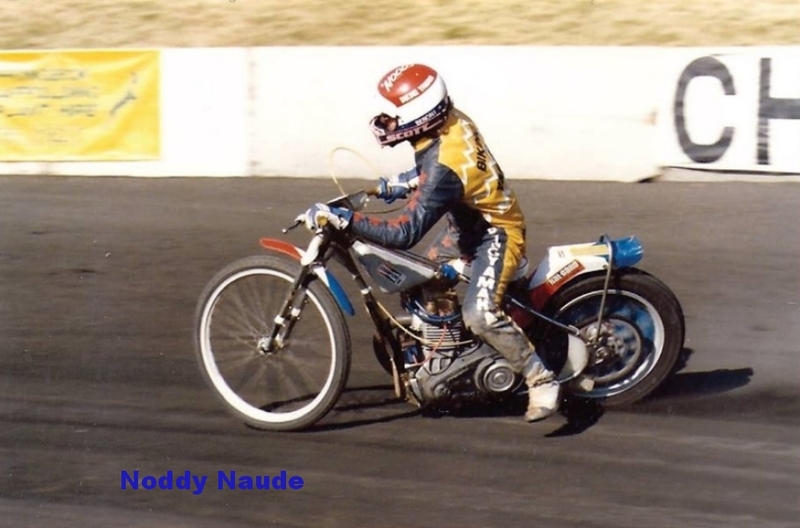 The squad was to have been led by national champion Deon Prinsloo but his UK club, Peterborough Panthers would not release him from his commitment to their league programme and so Noddy Naude was Captain and local guest were used to make up the number. The Johannesburg Speedway Club, as they were called for the tour, (i.e a club tour, not an inter-national series,) found success on the track hard to come by, as the scores below testify, for the standard of the Poles turned out to be higher than had led to be believed, and when Naude was injured in the second meeting and was foced to miss the next 2 matches there was no chance of improvement. Guest riders aside, the Stefani brothers, Golden Helmet opponents that season, bagged the most points, followed by Karl Lechky Jnr. 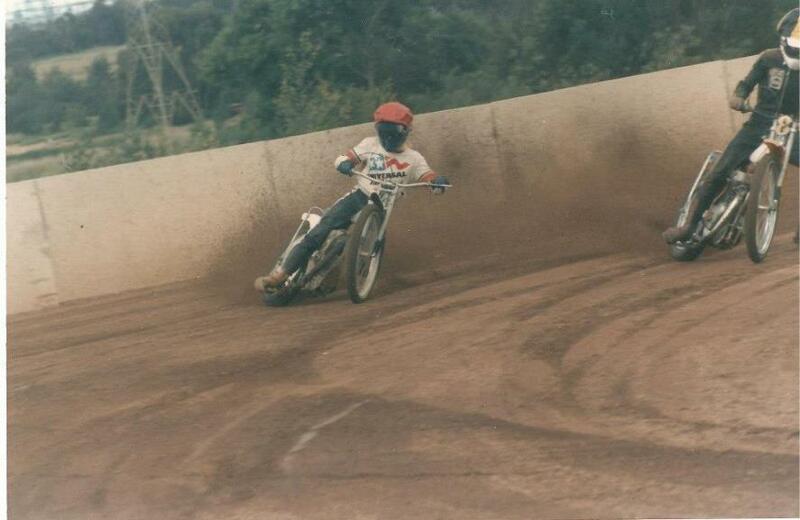 Lechky went on to take the S.African Championship a few years later. DB = Darryl Baldwin, BC = B.Compton, IvK = Ivan van Niekerk. 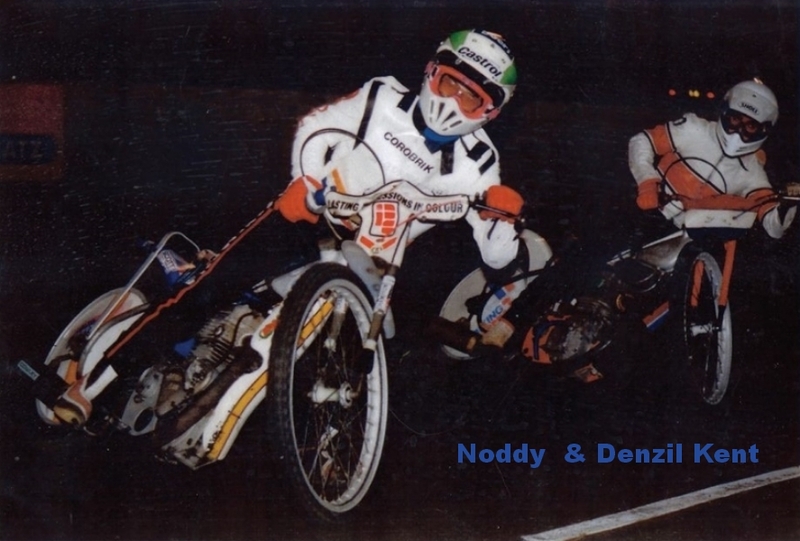 Below, 4 shots taken at Ostrow, Poland during the 1994 tour of Polish Div'n 2 clubs. Darryl Baldwin, Karl Lechky, Bevan Compton. 1996 South African Speedway League. - Red Eagles: Bevan Compton, Franz Leitner(AS), Tomas Stadler(AS), Deon Swart; Jnr: Clint Slowgrove. - LK Tuning: Karl Lechky, Gabor Roth (HG), Laslo Bodi (HG), Warren Meier; Jnr: Anton Plancko. - Nelspruit Aces: Deon Prinsloo, Tomasz Fajfer (PL), Gienek Tudziez (PL), Darrly Baldwin; Jnr: Alfred Slowgrove. - Hisbay Co: Grant Baynes, Sebastian Ulamek (PL), Rafal Osumek (PL), Andrew Szilagyi; Jnr: Ashton v.Niekerk. Karl Lechky @ Bradford UK, 1997. 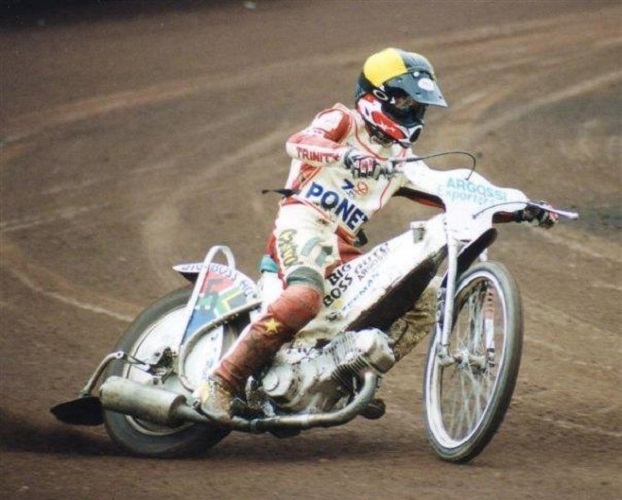 Karoly 'Karl' Lechky was S.African Champion in 1997 and as such qualified for the Overseas Final of the World Championship held that year at the Odsal Stadium, Bradford. 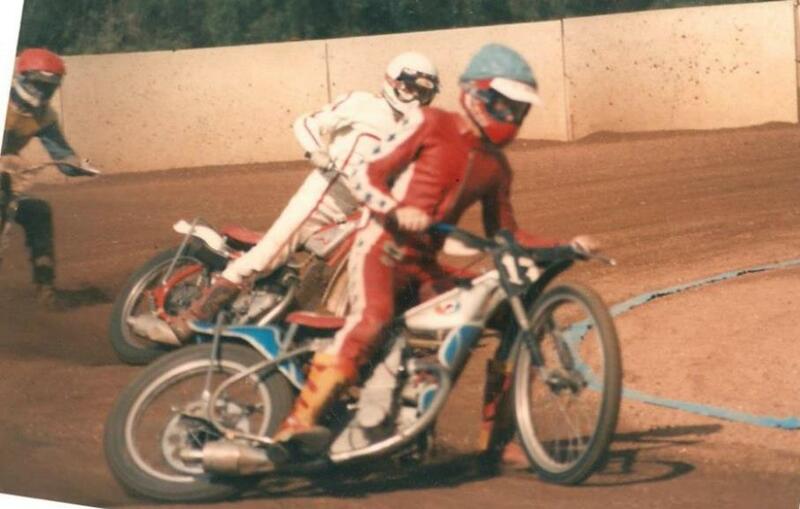 He had been riding for a Polish Div'n 2 team that European summer. 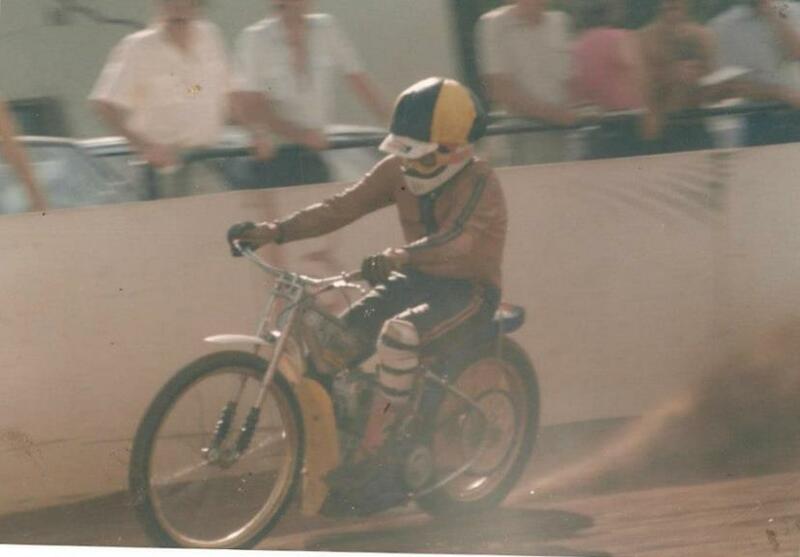 The following year he again rode in the Overseas Final, held at Poole, UK. 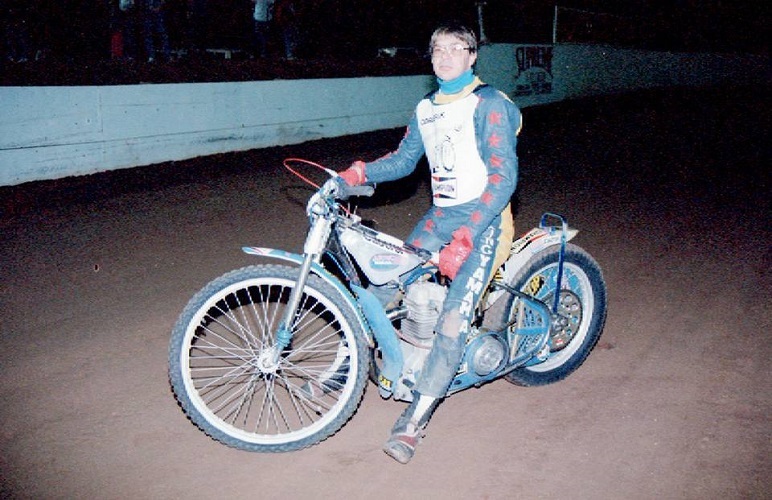 This article accompanied the photo from the Speedway Star of 28.6.97. 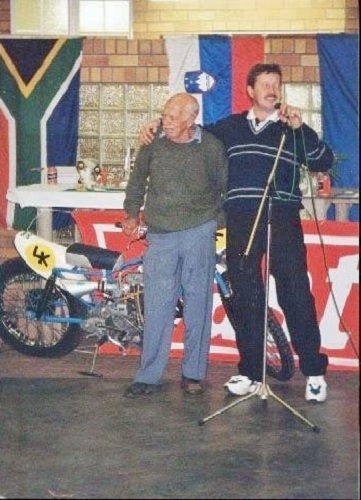 The picture below was taken at Brakpan circa 1997 and shows the lads that were racing there at that time. If you can help with the names missing from the line up please do so via the Contact box on the last webpage. Rear: ? , Deon Swart, Bobby Devine, ? , ? (Eugene Smith? tbc) . Knlg: Darryl Baldwin, Deon Prinsloo, Bevan Compton, ? ( perhaps Grant Baynes ? ), Karl Lechky, ?